The red carpet dress has to be eye catching for the 3 minute walk! Tweeters aren’t known to be a forgiving bunch. On top of all that this year’s figure skater, Johnny Weir, is joining Ellen Degeneres for the Oscar show. Johnny Weir is known for telling it like is is, red carpet walkers will have to endure his eagle eye. I doubt he will miss the smallest detail! The dress was designed for her by Louis Vuitton. (Lucky Reese). This lovely photo of Reese Witherspoon courteous stylefrizz. 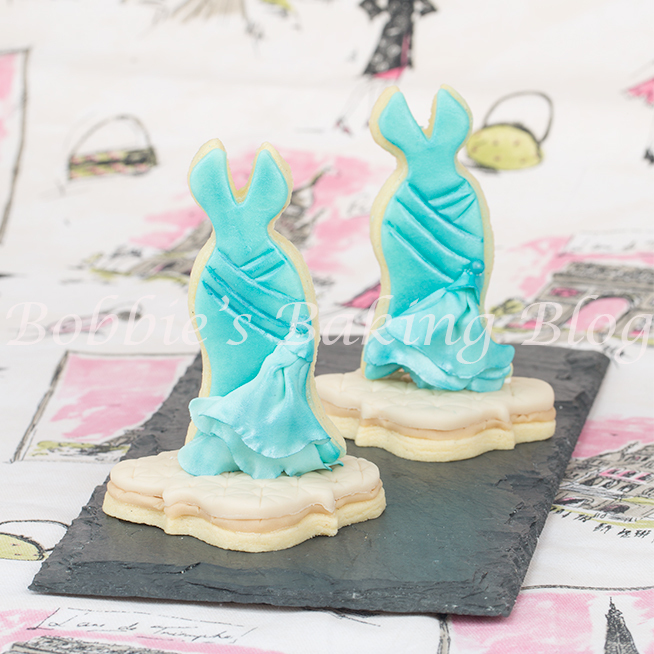 Two different dresses using the same ruching fabric fondant technique! 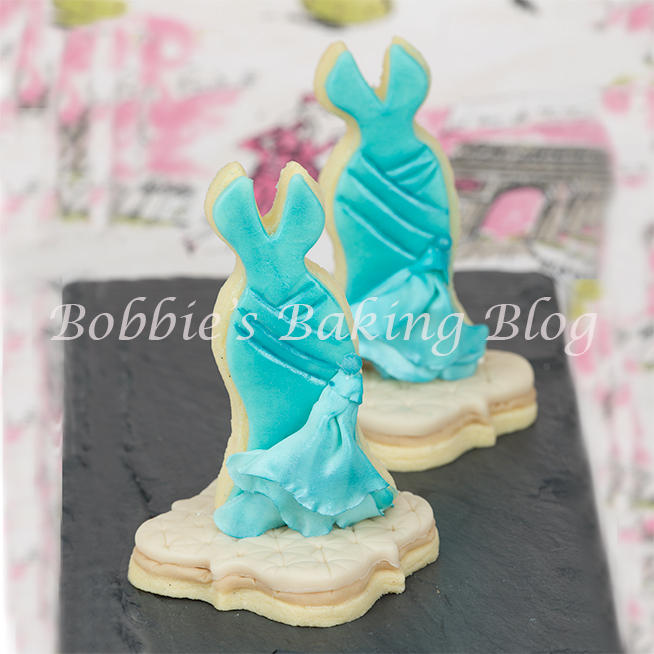 Once your sugar cookie dresses are cooled, brush your sugar cookies with clear piping gel (lightly brush). Roll your coloured fondant out to # 0 through a pasta machine, using the dress sugar cookie cutter cut the fondant out, dust with blue shimmer petal dust. 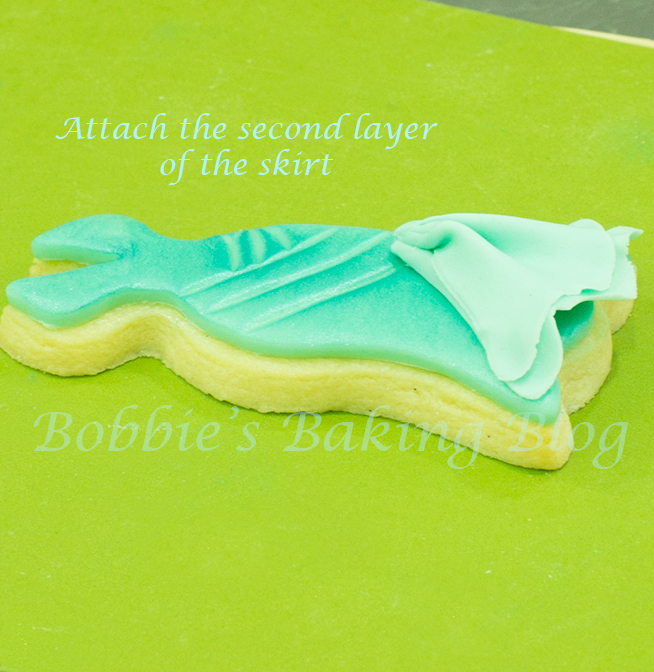 Place on top of the sugar cookies, and smooth out the fondant to adhere to the sugar cookie with fondant smoothers. This process is done for both cookies. The dress hugs every curve! 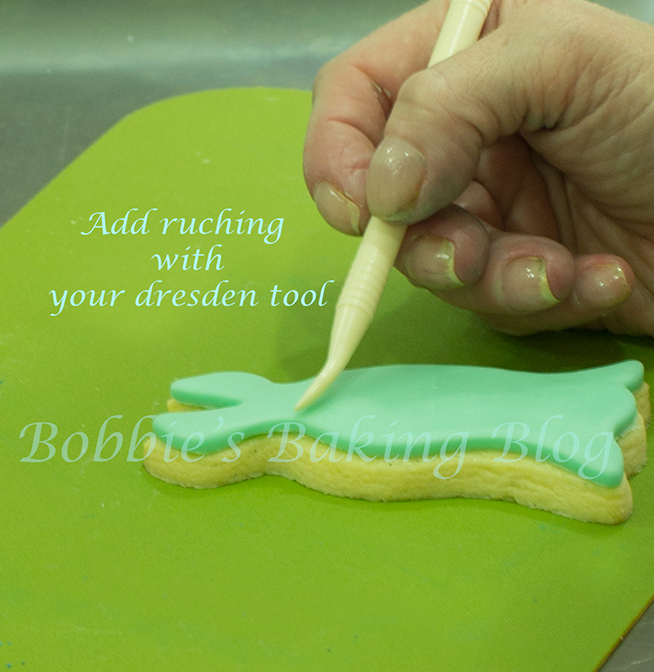 While fondant is still pliable use your dresden tool to draw lines of ruching, if you look at ruching on a dress it tends to go in different directions. 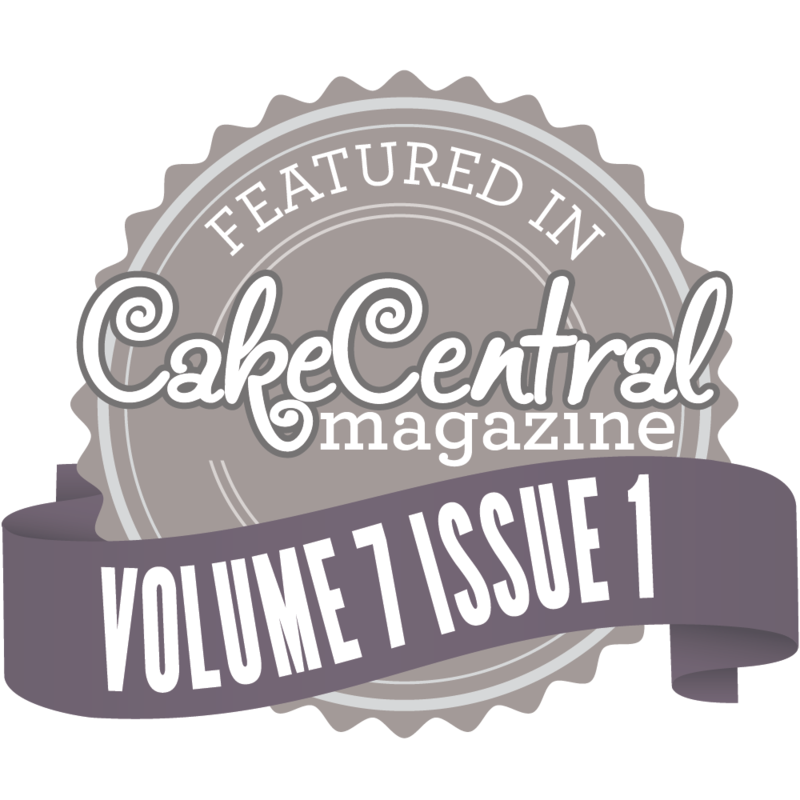 You most likely will need to re-dust the fondant. Mix your breakfast blue fondant with white gumpaste/sugar paste, known as a 50/50 mixture. Once the paste has been amalgamated roll the paste out to a #4 through the paste machine, or transparently thin. 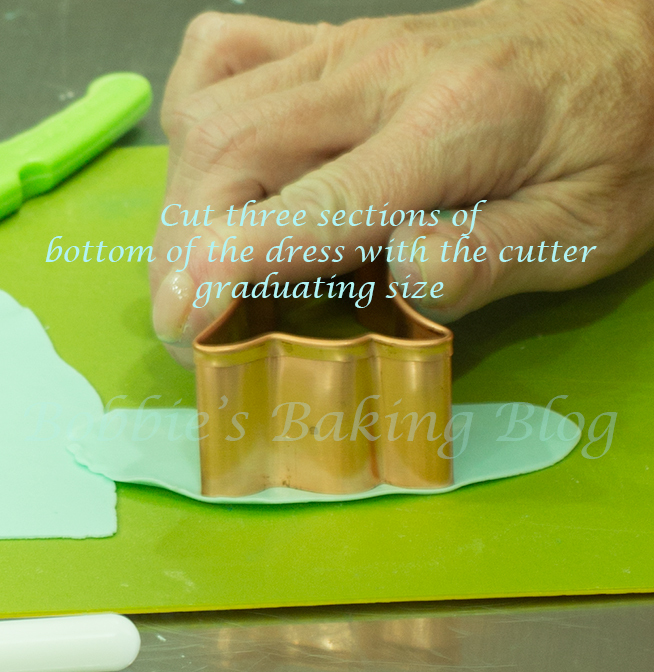 Cut three sections of the bottom of the dress with the dress cookie cutter, graduating in sizes. Place two under a stay fresh mat and place the third on a foam pad. 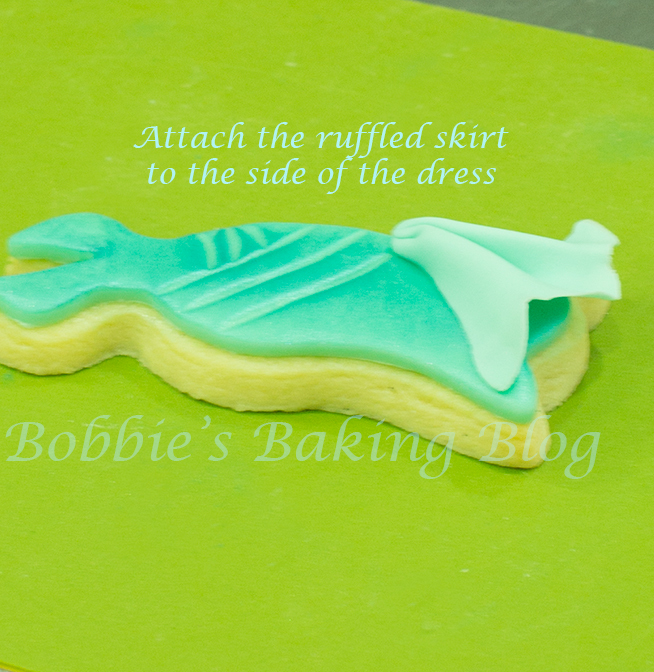 With your medium Celpin ruffle the very bottom of the dress, and gather the ruffled pieces together without letting the fondant stick. Pinch the top and open the rest. Attach the gathered ruffle skirt to the side of dress, where the ruching lines meet. Repeat the same method for the remaining two pieces, attach the pieces on top of one another. 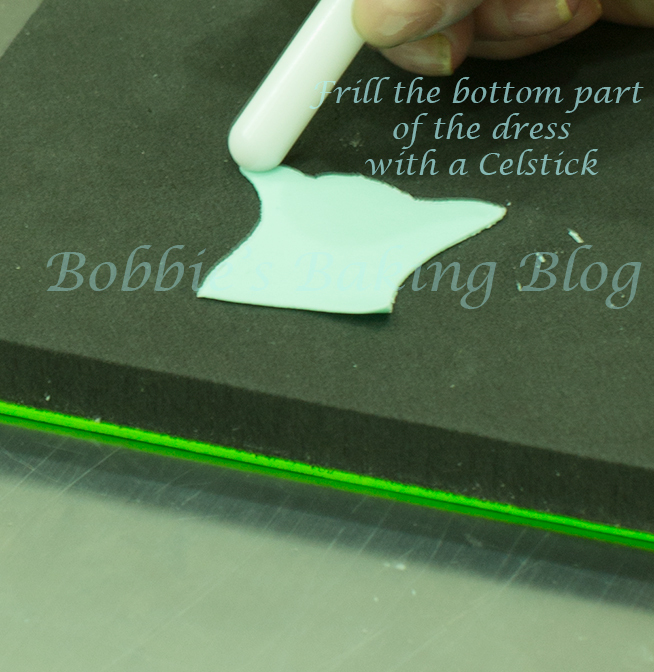 Cut a small piece of thin 50/50 paste using your Celpin hollow out the piece and place over the tip of three skirts making a cap. Mix blue shimmer dust with Everclear or lemon extract to create a paint. Paint the ruching lines on the dress to deepen the colour, and place a clear dragee in the paint to match the color. 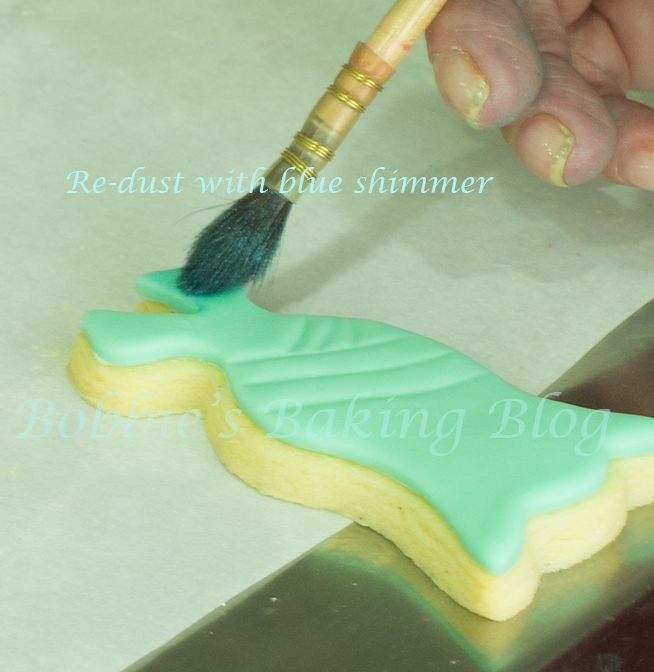 With a soft brush dust the skirt section with the blue shimmer dust. Once the paint is dry on the dragee pipe a little royal icing and attach to the cap. 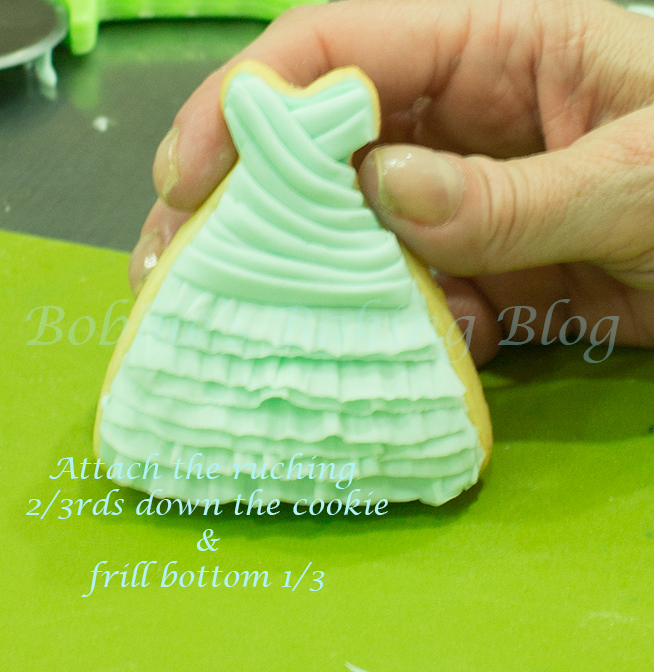 Wait at least 4 hours to over night after fondant has been applied to the blossom dress. 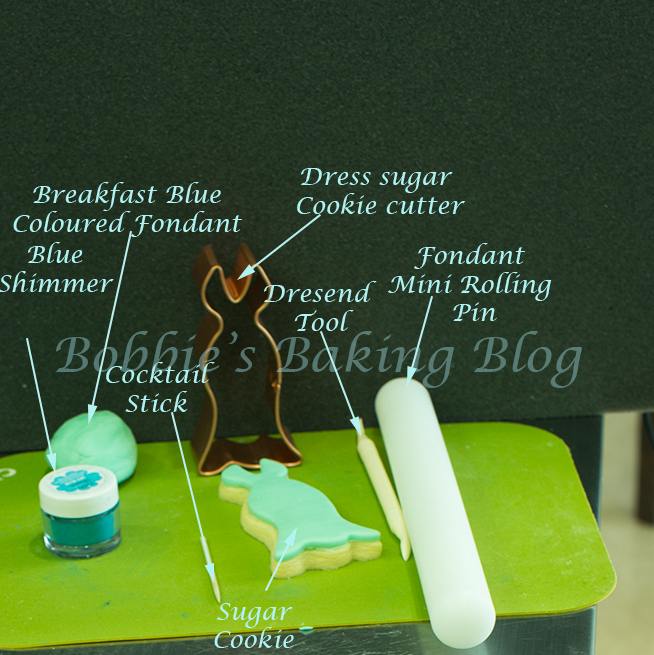 Mix your Breakfast Blue fondant with sugar paste/gumpaste until the paste is amalgamated. Roll the paste through a pasta machine gradually to #6, or until transparent and very thin. 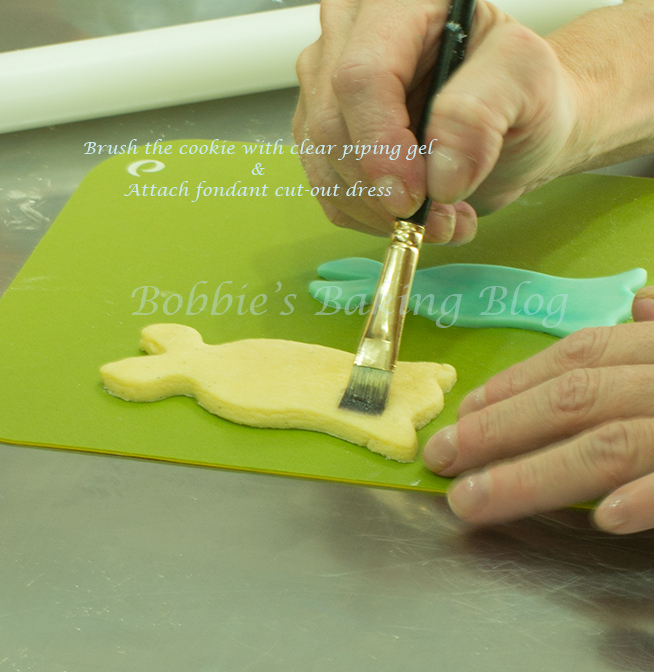 Cut the thinned paste into several strips, about 50 mm/2 inches on the smallest setting for the width on a ribbon cutter. Place all the strips under a stay fresh mat, except one. Place the one strip on your foam pad and fold the strip in half lengthwise. 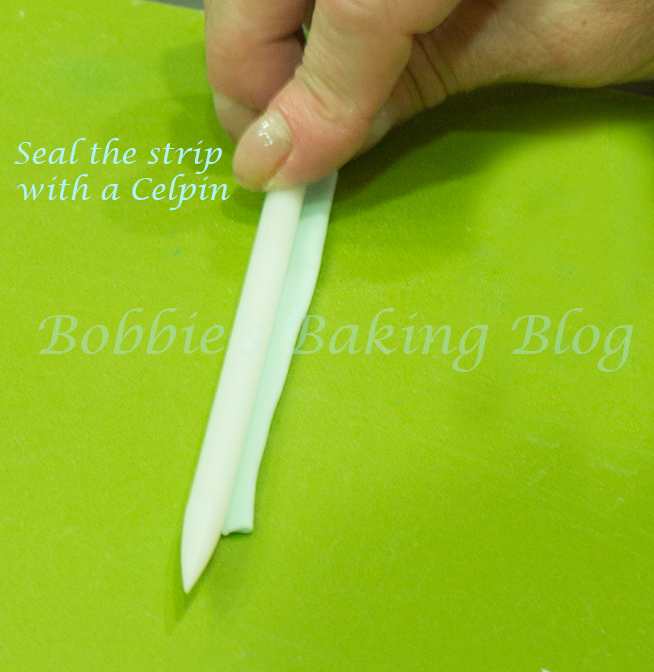 With a small Celpin roll the edges to close, the strip should be a little puffy. 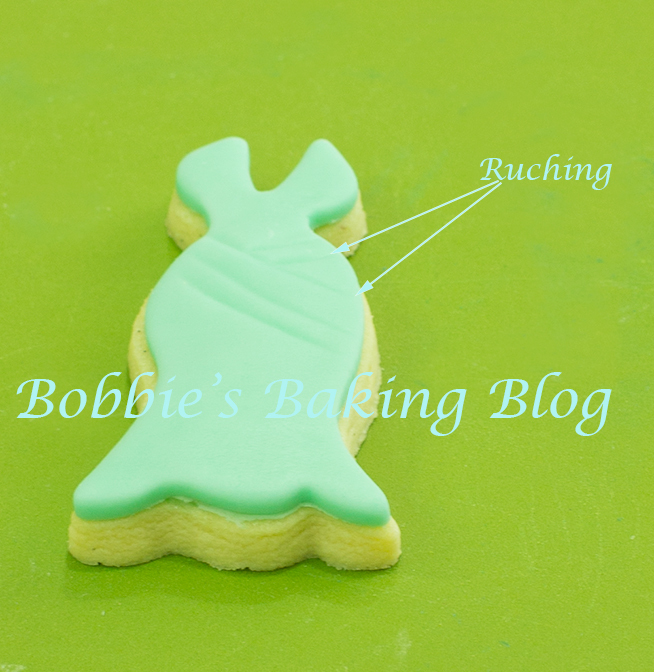 Attach the fold on the bodice of your sugar cookie on the diagonal with a little water, cut the excess with fine sharp scissors and smooth the paste’s edge against the fondant. Continue to slightly layer the folds on dresses about 2/3 of the way down (leaving one fold out), and frill the remaining strips from the bottom of the skirt to the where the folds ends. Attach the frills 1/3 up from the bottom. 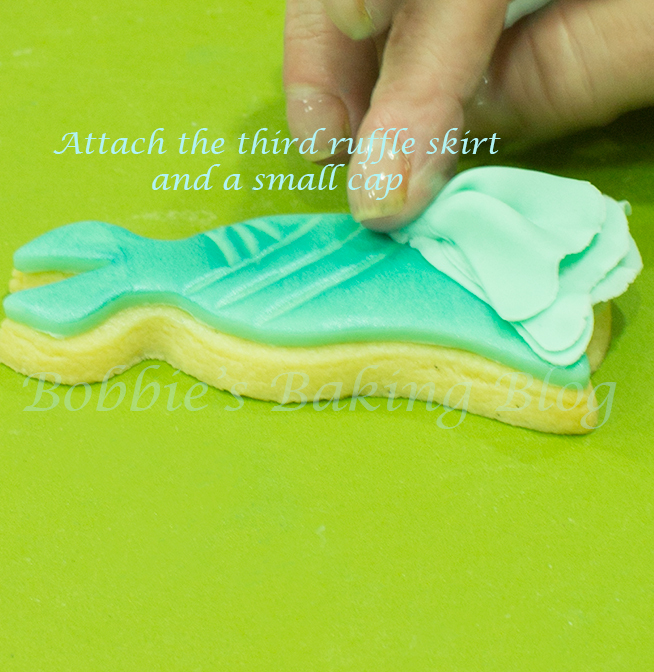 Attach the final fold over the tip of the highest ruffle. Dust the ruching folds and the ruffles with blue shimmer. 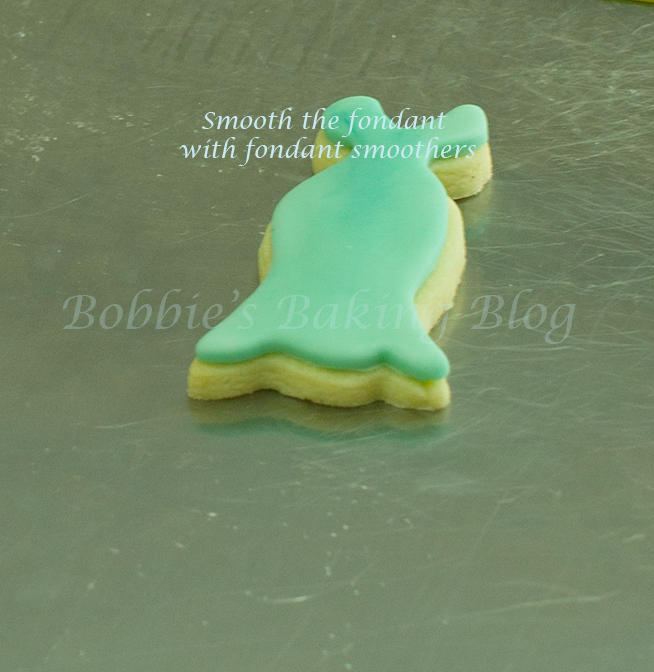 Cover an elegant square sugar cookie with fondant, we used mocha flavor. 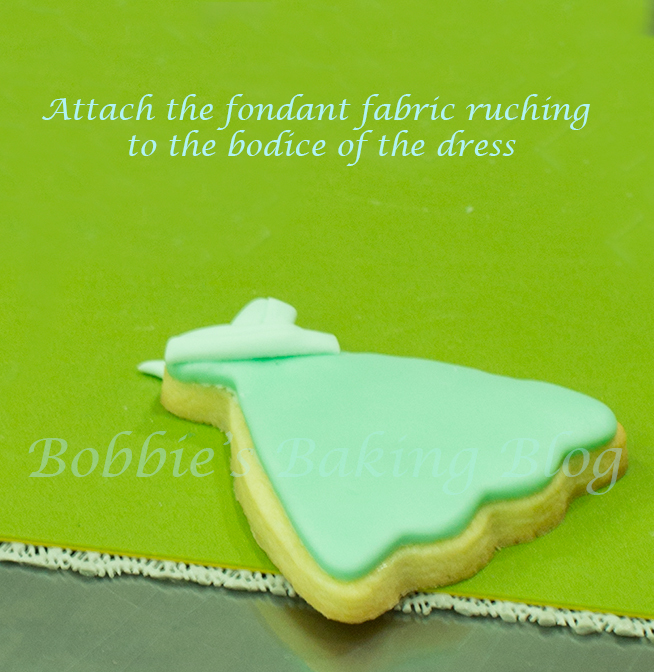 Wait at least four hours before piping royal icing on the bottom of the sugar cookie ruching dress and attach to the elegant square. 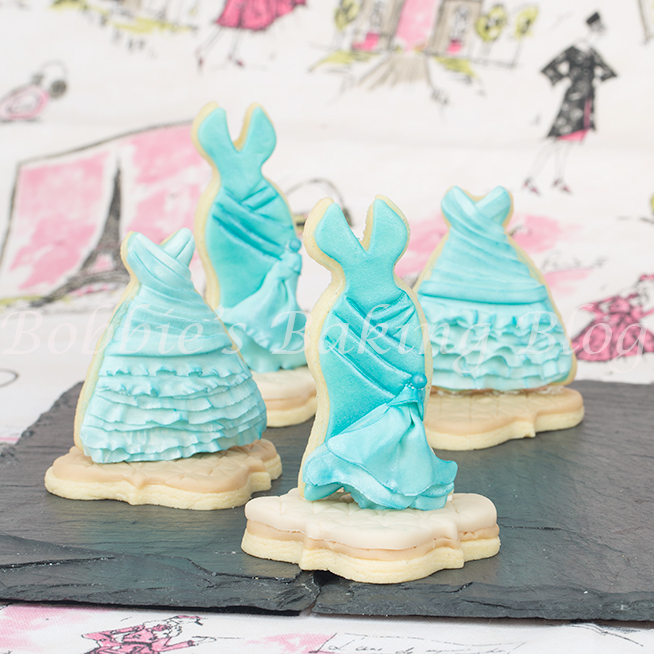 Hold the dresss cookie until it stands on its own. 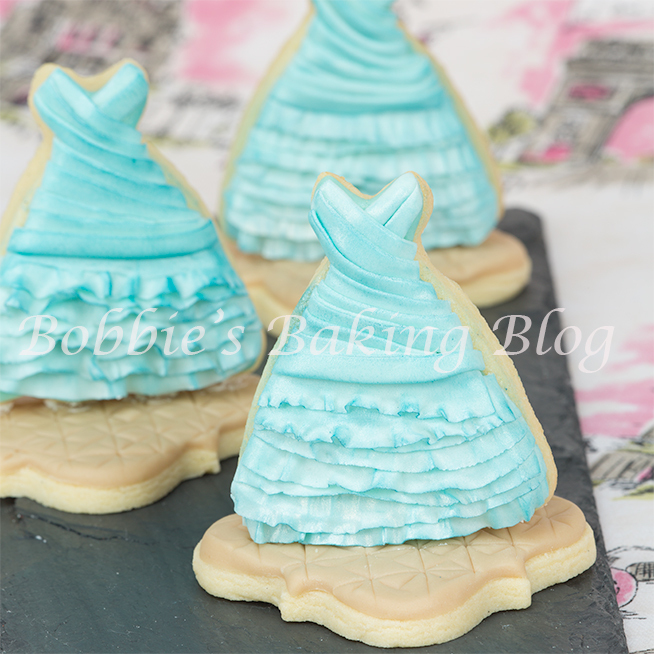 I would love to see you fabric inspired designer 2014 Oscar dress sugar cookies! 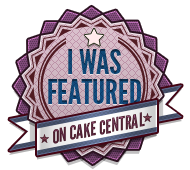 I’ll be watching the 2014 Academy Awards , however unlike the “dress critics” I will be looking for cake decorating ideas! 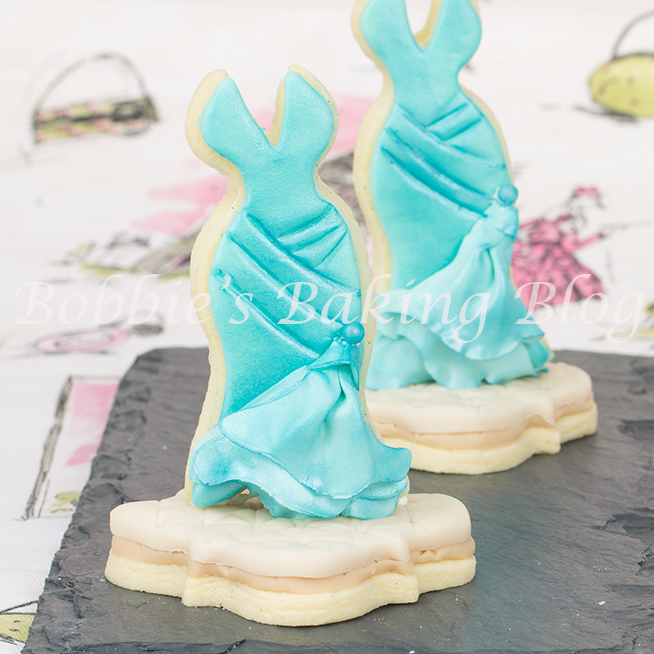 I must admit fashion inspired fondant is a favorite of mine! 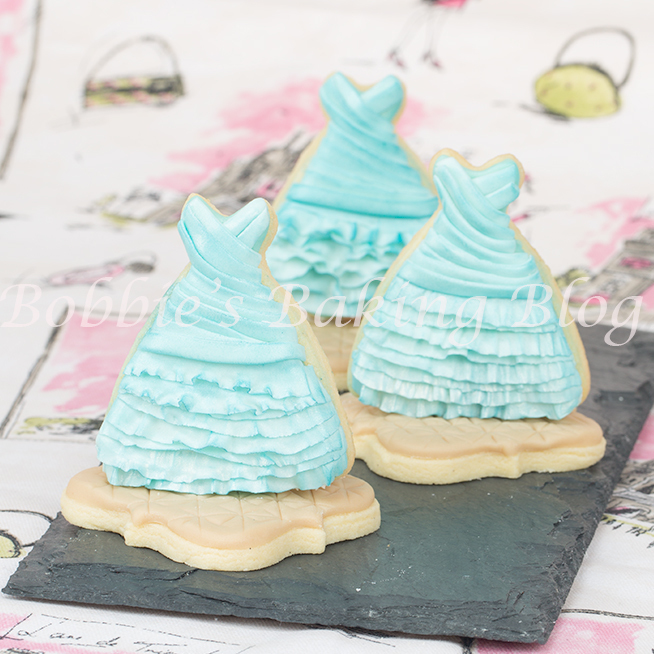 I read your article before the red carpet ( I love your work BTW), and found myself looking at designer dresses with the idea of replicating them to sugar cookies! 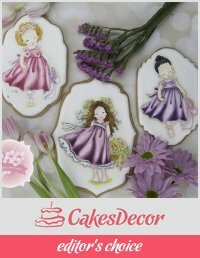 I am glad you’re having cookie art fun!